Last time I wrote the roses were just blooming and now coolness of fall appears at the edges of the day. In fact, our almond tree is a little confused and had a single almond blossom amidst the thinning leaves. Five months ago, my DH was two months post-op from his ninth back/neck surgery, I was taking my first course towards another Masters degree, my daughter brought down our oldest grandson for a summer’s visit and when the semester ended I drove him back north. The visit north felt like a sewist of old because I took my sewing machine with me and sewed alterations for my mother, and then at a sister’s sewing up sidelight curtains. It has been a blur and continues. 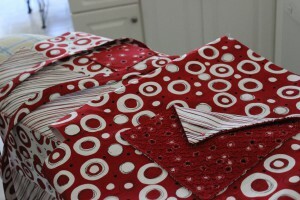 I will be returning in the next month to help my daughter and will again take my sewing machine. Yesterday, in an attempt to feel some control, I pulled out a project I started two years ago. 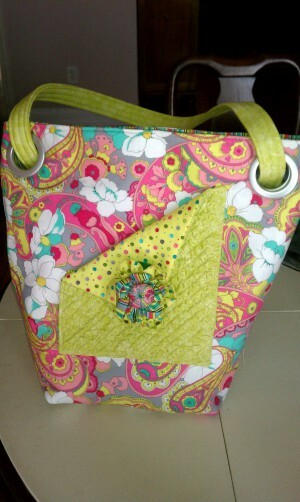 This is Letty’s Bag by Robin Gallagher at Robin Quilts, etc. 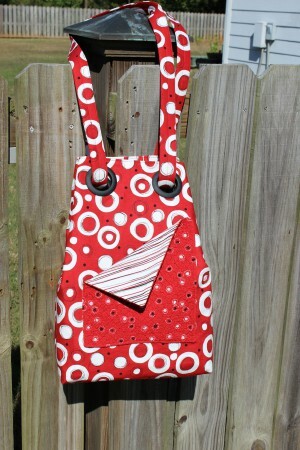 The first one I completed and gave away as a diaper bag. This one I made in red, my favorite color and will probably take with me on long days of shopping or filled with needlework as it is huge. Some things I changed were the Texture Magic on the front pocket; using Pellon 809, a firm but not fleece interfacing and the dimensions. On the front pocket I used Texture Magic just to add more interest to the pocket and I am adding a flower instead of a button as called for in the directions. The interior has a pocket that lines the complete interior of the bag and a cell phone pocket. The the strap instructions are the best I have followed to date. Letty’s Bag in progress showing the use of Texture Magic on the front pocket, the interior pockets and the strap. I have actually completed the bag. One thing of which I was again reminded, check to see if there are any corrections before starting a project. My bag is taller than wider, this works for my knitting needles but might not be how you would like to see yours. It is a great bag and I will make it again in the smaller version at a later date. This is a great reminder to see if there are corrections posted for patterns with which you work. I have a taller rather than wider bag, this will be great for knitting but you might want it made differently. So check for errors before starting a pattern. Speaking of knitting, I am in the process of knitting a lap blanket for a gentlemen who might be challenged by cancer. Although not diagnosed I wanted to do something for him. This is the Lion Brand Yarn (LBY) Traveling Cable Afghan, free pattern L32046 on their site. I have the main portion knitted and am now working on the border. I had enough of LBY Homespun in my stash to make this afghan. It feels great to get back into needling groove, needle on! 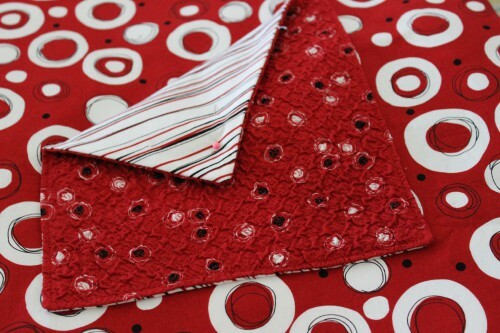 This entry was posted in Knitting, Sewing and tagged Bags, knitting, Sewing. Bookmark the permalink.